It is a general perception that installing white tiles in your bathroom makes your bathroom look big. However, people like their bathroom to look great. Bathroom is a part of your house and you want to leave a great impression on those who visit your house. Many people decorate house very well but their bathrooms are very old fashioned. To give your bathroom a great look, you do not need many things. Just pick the right tiles and sinks. 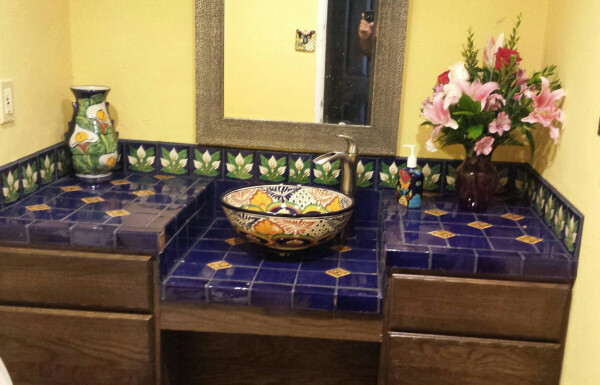 Mexican tile and Mexican sinks are stylish and beautiful due to the handmade pictures on them. Mexican tile gives great texture to the walls. They are especially created for decorating the walls where you want some creativity. Whether you choose a beautiful painting for your wall or pick from the many available prints, you will get customization. You can arrange these tiles in different shapes rather than arranging simple straight. Mostly, Mexican tile is used with simple tiles. A fine pictures or design in the middle of wall surrounded by white tiles or any single color tile gives best look. Many people like to add their creativity to this and install different designs on the wall. You can also use these tiles as a border for decorating any special object like window, wall fitted mirror or windows. You can use a fine design to cover the sides of any object in the wall and rest of wall will be of single color without any design. You may also like the alternate tiles Mexican style arranged between simple tiles to give a great look. There are many ways of using Mexican tile. Your bathroom will get an attractive look and you can display your love for art in your bathroom. Some people cover whole bathroom with tiles while some people like to cover only bath area with tiles and install only one third or one-fourth part of wall with tiles in remaining area. In that case, you can use different designs of tiles for covering the edges of tile section and middle of the tile area. Here also you can use alternative methods for combining simple tile with Mexican tile. Your creativity will not limit to tiles if you are choosing a Mexican style decoration for your bathroom. Say goodbye to the single color sinks and give your bathroom the beauty of floral design Mexican sinks. There are many designs available for the sink. You can ask for a personalized sink. Because they are handcrafted, you will a unique look for your bathroom. Mexican sinks are made of ceramic and they last for longer. Ceramic is the best material for a bathroom because it does not leak and has no serious impact of water or other chemicals used in bathroom. There are many other materials but ceramic is the best due to its properties. Ceramic tile manufacturing is done in jumble with help of machine hence single color tiles are always preferred but using the single color tile is not essential. You can also use designer tiles by adding only a little cost to your pocket. You do not design your bathroom everyday hence spending an extra amount is not bad. The Mexican sinks and tiles are reasonable and they can make your bathroom look attractive. Highlight the beauty of your house by installing the extraordinary designs of Mexican style. The painting on tiles or sinks has good colors and do not spoil for long time. This keeps your bathroom look good for a long time. These tiles are great for household decoration too. There are different designs available if you do not like to stick to floral designs only. You can also ask for a customized designs.